These guys were able to come out quickly, and fix the issue with no problem. They were also professional and easy to work with, and were good at explaining clearly what the issue was (as opposed to a condescending tone I've occasionally experienced with contractors). Would recommend, and will call again if I need appliance repair! Technician described problem and serviced in initial visit. Nate was courteous and completed work in very efficient Manner. If needed I will contact Neighborhood appliance without hesitation. I just moved into a new house and I have had a lot of different types of technicians come for service and Neighborhood Appliance has been the most professional and timely--hands down. From the communication, to the technician, to the service... I cannot recommend them enough. Keep up the good work guys! Prompt service. I would call this company again. I was very pleased with my service call. Jeff J was knowledgeable and explained everything very well. He repaired my refrigerator quickly and expertly. I will definitely use Neighborhood in the future. On time. Got a call to discuss options.parts were in the truck. The tech came on time and even sent an SMS text message before his arrival. He fixed my General Electric dryer because it wasn't drying the clothes. He went to his magical truck and came back with a part and the next thing I knew the dryer worked like a dream! Thanks again Neighborhood Appliance Repair Co! Came on time and Jeff did a great job. Thank you. Honest and reasonable. The tech was knowledgeable and saved us a bundle! Quick service, repairman very knowledgeable, well satisfied with workmanship, will recommend to others. Brett is a great Tech. Awesome job and in a very timely manner. Would highly recommend Neighborhood Appliance. Thanks for a job well done. After searching online, I found Neighborhood Appliance, and called them because of their reviews on the web (supporting local business and family owned). Upon calling I received an email and text message to confirm my appointment. Shortly before the repairman arrived I also received a text message informing me of his arrival. Frank then showed up, he had the part on the truck, and was able to fix my fridge right there on the spot. I would suggest anyone who needs an appliance repair to call these guys. They are professional, courteous, clean, and they know what they're doing! LOVED my experience with Neighborhood Appliance. Brett came as scheduled and on time. I was informed when he was coming, he was polite, thorough and extemely helpful - even though it was a busy day before Thanksgiving. When he had to order the needed part, he came back in timely manner and completed the job as promised. I would recommend Neighborhood Appliance to anyone. We were very pleased. One phone call in the morning and I quickly was set up for a lunch time appointment. The person taking my call and the service person all gave great service. Fast, friendly and efficient. Highly recommended. I had a great experience with Neighborhood Appliance! It was very easy to schedule the appointment. They sent a text to confirm the appointment and the name of the technician. Another text on the day of to let me know he was en route. Merki was great! He had my washer fixed in no time. He was very knowledgeable, courteous and professional. I would recommend this company to all of my friends! Thank you! The gentlemen who came to my house were both very friendly, efficient, and well prepared to perform their duties. No time was wasted, they did their job and left as soon as they were done. They were both tidy and left no mess for me to clean. I would recommend your company to anyone I know who needs repairs for their appliances. Frank was great. He arrived during the time window I was given and was both polite and efficient. I will be calling again should the situation arise! We received prompt and efficient service. Rob, the technician who came could not have been nicer. Great job. Excellent customer service! Last week on Friday April 8th, Neighborhood Appliance Repair Co. repairman Merki arrived on time well within my assigned "window" to diagnose my malfunctioning washing machine. He was personable, knowledgeable and competent. He quickly diagnosed the problem and ordered the correct parts. I asked him a question about the "Duets" matching dryer. When the washing machine parts come in, he will return to repair the washer and to clean out the dryer's lint venting system. He gave me a thorough explanation for everything which was easy for me to understand. I'm confident that Merki will do a great job with the repair and cleaning when he returns! Excellent service from Neighborhood Appliance!! Prompt, friendly and helpful. I would highly recommend using this company for your appliance repairs!! We recently required your services at our establishment and our staff wanted to thank you for your prompt and efficient customer care. The communication and effectiveness of your company was reassuring and helpful since we had never used your services before. Merki, the repair technician that helped us was very helpful in making sure we all understood our options for repair and educated us all on what our best option would be. Thank you for your service and we will be using your services in the future if any problems arise. Tiffany M. and the staff at 2nd Story Theatre. We had a great experince. Murkey was very polite and professional. He fixed our ovens just expected. He offered and put booties on to keep our floors clean. He is a very nice young man and did a great job of representing your business in a positive manner. I will recommend you and he to my friends. The tech came on time, and he was very knowledgable and courteous. Tech was delivered same day as my call. I was very pleased with the service from Neighborhood Appliance Repair Co.! I will definitely be calling them again when the need arises! I have used Neighborhood Appliance several times over the years for just about every appliance in my home. Stove, refrigerator, washer, dryer, dishwasher- you name it - they've fixed it or allowed me to make a judgement call to replace it. They techs all arrived on time, knowledgeable, and courteous. They have always had the repair parts on hand and able to make corrections on the spot. I am more than pleased with their service and are well worth the visit. You won't be disappointed. My technician yesterday was an absolute gentleman. He was friendly and very professional. He took the time to explain to me what was happening with my dishwasher by turning it on and showing me. He ordered a part for me and showed me how to install it or offered to return and do it himself. He respected my space and home and took a moment to say hello to each of my kids. Wonderful experience! I wanted to recognize my service tech, Robert R, who was extremely courteous, polite, and efficient when he worked on my dishwasher. Thank you for employing such a kind service tech who not only repaired my dishwasher, but made me feel comfortable and respected while he was in my home! I had my washer fixed yesterday. Merki and Robert were friendly and efficient. Excellent job. I would highly recommend your service. Tech merkie is so efficient pesonable . Gets job done in short span of time & I never have to clean up after him! Love the booties... They show respect. I would call your co. Every time! Merki was at my house yesterday to evaluate four appliances. WOW! He was great. So timely. So quick. So smart, So courteous and kind. So knowledgeable!!! He could tell just from the sound of things what was wrong. I will always be coming back to request him whenever I have problems with appliances. I've never had such a good experience with a repairman. Thank you for the excellent service to date. He'll be back to finish after parts come in. Merkie is very personable and an efficient worker. He is also a very polite gentleman and made it a point to check in on my husband whom he knew had been diagnosed with cancer recently. I would recommend him to anyone. Very pleased with service and knowledge of staff would recommend company to others .Tech was prompt and courtesy. Merki M. came out yesterday to help me out with a broken dishwasher. He was quick, professional, and knew exactly what he was doing. He had the part to fix the appliance in his truck and with his skill was able to help us avoid paying for a much more expensive repair. I'm really pleased with my choice to use Neighborhood Appliance Repair. Yours will be the first number we'll call for future repairs. Thank you. Very quick service. The technician arrived promptly at 10:00 a.m. (we were told to expect him between 10:00 and 1:00). He quickly assessed the problem and had the washer working again within 15 -- 20 minutes. He was efficient and pleasant. We would recommend this company. I called Neighborhood Appliance Repair because the water dispenser on our refrigerator was not working. I am very happy with the quick response time. A tech arrived within an hour of my call. The tech was professional and courteous. He explained the problem and was able to fix it without having to order any parts. I am very satisfied and would not hesitate to use them again should the need arise. Yesterday I chose Neighborhood online because my dryer was making a very loud squeak. They were able to accommodate me that afternoon. The technician was very polite, friendly and knowledgeable about my brand of dryer. He was able to fix it because earlier in the day he made sure the truck was stocked with just about anything they would need for a repair. Excellent service and they offer a senior and military discount. I highly recommend Neighborhood. The service was good, the technician was awesome. I must admit when I called Neighborhood Appliance Repair Co. I didn't expect them to send out a technician to come out the same day to my home. The tech was very polite and knowledgeable about my issue I had with my Maytag oven. He informed he had the part I needed for the repair in the truck and if I would like him to fix it. I told him yes, he then proceeded to give me the estimate to fix it. I signed it and he had the oven fixed in a matter of 10-15 minutes! Would I do business with Neighborhood Appliance again?? The answer is yes. 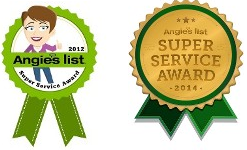 I chose Neighborhood Appliance Repair from Angie's List and was very impressed with their response time and repair service. I received an email response to my request within 10 minutes and a repair tech was at my door within 2 hours of my request. It doesn't get much better than that! The tech was courteous, neat and explained the details and cost of the repair. I will be using them again. I called Neighborhood Appliance after not hearing back from another appliance repair business. A person, not a machine, answered the phone when I called and a repair person was at the house 90 minutes later. The repair was performed in less than a half hour and at a reasonable price. Robert, the service person, was very professional and courteous. I would recommend this business for appliance repairs. Merki was very professional and did his job above and beyond. He takes his job very seriously and I would totally recommend to others that may come in need of his assistance. Contacting and scheduling an appointment with Neighborhood Appliance was very easy and convenient. Use of email and text messages provided me with timely information, especially knowing that my appointment was on time. Robert, who was assigned to my service was genuinely interested in the problem with my appliance and spent enough time to diagnose and repair the refrigerator. I am very happy with the 90 day guarantee, and confident with the work performed. We just wanted to let management know how pleased we are with the service provided by Merki. He is very polite, personable and proficient. We would highly recommend him to anyone needing appliance service. This is the second time I have used this company. Two different technicians with the same result. Very professional, courteous and good. They are prompt, and responded very quickly to our service call. Price was fair but you get what you pay for. I would definitely use them again. They're excellent. I called a different company before them and they didn't know how to fix it. But the first thing he did was open up the kick plate underneath the washer and the instructions for installing it were in there. It had all the stuff he needed, like the parts number. He deduced what the problem was, ordered the part and put it in. It was like night and day from the first company. He was able to determine the problem within about 10 minutes. He was also pleasant. My experience was excellent. They had to order a part for my old dryer and were able to get it within a reasonable time. They came back a second time without charging me anything extra, which was a good thing. Both the office staff and the repairman who came to my home were courteous and professional. The dryer works again, also a good thing. This was my second call to Neighborhood Appliance. The first time in July 2014 they fix the thermal sensor in our dryer for $175. When our dryer stopped tumbling I knew who to call. Both times service on the phone was pleasant, they were able to get a technician out right away, and the work was done quickly. Rob came out both times and was pleasant and efficient. I would not hesitate to call them if I needed additional appliance repair. They had to order the part, but they kept me in the loop about timing and were quick to come back out as soon as the part arrived. Very friendly and professional employees who came out, and my dishwasher is working great now. Would definitely use them again! I called on a Sunday, received a call early Monday. Repair scheduled for midday Monday, technician arrived during appointed time and called ahead as promised. Dryer vent cleaned out, broken parts replaced and dryer works again! I couldn't be happier! I am very pleased with the service I received from Neighborhood. The technician was very knowledgeable, courteous & friendly. I would highly recommend this company. Robert was prompt, very nice, and answered all of our questions. Parts need to be ordered; and will return. Our Maytag electric dryer had started making a horrible screeching sound, so we hoped it was repairable. We did a bit of research and found this company to be well-reviewed on several places on the internet. We were impressed that they were able to schedule an immediate visit. We were given a window when they would come, but we got a call asking if they could come earlier and were happy to have them. The tech was professional and my wife found him to be courteous and competent...After taking apart the dryer and doing a thorough diagnosis, the tech went out to his truck and came back with the news that he could do it immediately with parts he had with him. We were very pleased and the dryer is running very smoothly and quietly. No problem. Part was ordered and replaced as promised... On time. Very well. Turns out it was a cable not the main board as expected. Felt that they could have performed the more pricey repair and not tell me about the easy fix. It went very well. Jeff was very nice and professional. He was very prompt and explained what he was doing. He was careful with the hardwood floor when he had to pull out the dishwasher and put it back in. He had no problems in quickly diagnosing and solving the problem, which was a connection that had come loose underneath. I would definitely use Neighborhood Appliance again, especially after I had a very bad experience with Sears service prior to calling Neighborhood Appliance. The difference that calling a local, respectable business makes over a corporate call center for repairs was a real lesson for me. I liked Jeff very much. He answered all my questions. We commiserated on the over-complications of newer appliances, and how often, in spite of ridiculously high price, they break down. He didn't push an expensive repair, which I appreciated. While there, he looked at other appliances and gave some good advice. I'm going to have him stop by every year or so to makes sure everything continues to run smoothly--worth the cost in peace of mind. Refrigerator would not cool down below 53 degrees, while the freezer stayed at or below zero. Called Neighborhood Appliance repair, which is open on saturdays at about 8:30 am. They gave me a window of 12 to 3pm that same day. I asked if the window could be tightened to 12 - 2p because I had several functions to attend. They said no prob, and Jeff (the tech) would call before arriving. He called a little while later to ask if he could come even earlier. He arrived at about 11:30 am and had the job completed by 12:15. It turned out that my frig (a GE Profile) would not come out of defrost mode and the main circuit board needed replacing which he had on the truck. They performed a repair of the wrong part, charging my card for the part and service. When it turned out to be a much more expensive part that was the real problem, they refunded the money for the original part and all service except for the initial $60 visitation fee. Very reasonable, and I didn't even have to ask for the refund - it was simply offered to me. Not many repair guys would offer a full refund (less the visit charge) without even asking. Very impressed with the service I recieved this a.m. Having been in the service business for over 25 years (commercial) I would reccommend this service tech, Jeff in a second. But I'm sure all the service techs are also very good. My husband and I want to express our thanks for a job well done by your tech, Jeff today. Our call was made for help only last night at about 8 p.m. and your tech arrived as stated in your office confirmation between 11 - 2. We thought he was knowledgeable, and did a thourough job "diagnosing and treating" the problem. Jeff reflected well on your company in his neat appearance and manner. It is our good fortune to have found you online, and would not hesitate to refer Neighborhood Appliance Repair to others. Thank you for the prompt service! This is the first time I had a refrigerator break down and I didn't know who to call. After researching on the internet, I came across Neighborhood Appliance Repair. Since they are a member of the Better Business Bureau, with an A rating, I thought I would give them a try. I was not disappointed. Not only did I get quick service, but the technician was very nice and explained what the problem was and why it happened. Because of the nature of the repair, there was a further issue with water frozen in the drain line. When I called them back, they were able to return the next day and fix the new problem at no additional charge! Now that is what I call service! I have placed their number in my contact list, should I need them in the future, and would not hesitate to recommend them to others. I am very happy with the professional and courteous service that Neighborhood Appliance Repair provided today. They replaced the handle on my dishwasher and had the part on their truck, helping to make it a speedy process. I would certainly call them for any future appliance repairs and would highly recommend them to others. I would like to commend, Ken, for his outstanding customer service. I called this morning because my washer was not spinning. The tub would just fill up and drain. I stated that I needed a later appointment, as both my husband and I work until 5 pm. I was told that our apppointment would between 5-7. This was very accomodating! Ken called and stated that he will be a little late and my husband and I were perfectly fine with that. Ken arrived at my house and showed me how the washer works and the part that was broken. He also checked other parts to ensure that everything looked okay. We did not feel like it was just a business transation, we felt like we were given personalized treatment. Overall, Ken was very kind, informative, friendly, respectful; but most off all, he was honest. I appreciate that. I work in the customer service industry and I can tell you that he offered world class customer service. I will recommend this company to all my friends and family. Ken, you are a credit to your profession and an asset to your company. I called to order a somewhat expensive part for my washing machine. Rather than just take the order and move on, Jeff took a moment to ask about the symptoms my washer was exhibiting. He was able to quickly diagnose the likely problem(s) over the phone and offer a DIY fix...which WORKED!! Honest, friendly, expert advise with no BS. I will be doing ALL of my business with Neighborhood Appliance from now on. Thanks guys. Recently we had our washing machine repaired. The service was incredible. The repairman was truthful and efficient. He did not in any way push parts that were un-needed and predicted with absolute precision the correct remedy for repairing our machine. KUDOS to you for your impeccable honesty and remarkable professionalism!! Highly Recommended!!! Jeff is professional, respectful and represents your company well. Your next day response to my request and Jeff's on time proficient completion of the repair in addition to his professional demeanor, will ensure that I will call Neighborhood Appliance next time we need a repair. Thanks! Washer was leaking water, called at 7:30 am on Monday morning, was told repair man would be here between 1-4, tech was here at 4:00 pm. Repaired the machine for a reasonable price, was done in a half hour. Very coutious and professional. Neighborhood Appliance has worked on my oven, my dryer, and now my washer. Both technicians that have been to my home have been prompt and professional. Their knowledge seems endless. Very helpful in explaining the problem and what may have caused it. These guys have my vote and my confidence. diagnosed and repaired my oven in less than an hour. good price and great service. will recommend. Very prompt service! I called on a Saturday morning when I woke up to my freezer defrosting with $300 worth of groceries I had purchased the night before. I called Neighborhood Appliance and they arrived hours later with the parts needed to make the repair. THANK YOU NEIGHBORHOOD APPLIANCE! They came within one hour (and on a Saturday window of 1-3pm) when I made the call for our GE fridge that was only cooling to 54 degrees. Made the diagnostic within 20 minutes. The defrost was working but it was shutting off too quickly and did not melt all the ice on the coils (the computer board was shutting the cycle off too soon). Call out was cheaper than the official GE service which couldn't come until Monday or Tuesday... and they had the (8am to 5pm option to boot). Be sure to check out our friends in Lafayette, IN for the Best Appliance Repair shop in the Midwest!